To remember what you've learned about God, you need to keep a journal. Then, you can look back and remember what God taught you so you can be encouraged in the dark times of your life and know that God is still working for your good. 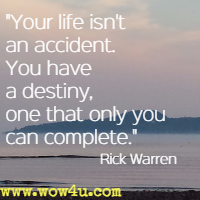 Your life isn't an accident. You have a destiny, one that only you can complete. Civility is just treating other people the way you'd like to be treated, even if you disagree with them - even if they're flat-out, dead wrong. Even if they're fighting against you, you treat them the way you would like to be treated. That's civility. The problem with stuff is, the more you have, the more it takes to take care of it all - the more you have to clean it, the more you have to protect it, the more you have to insure it, and the more you have to repair it. External evidence includes things like the number of copies of the Bible from around the time that it was written. That's what historians look for to see if a book is accurate and true to dismiss any possibility that a book was changed as it was passed down from generation to generation. There are 5,366 copies of the Bible from when it was written to just 70 years afterward. 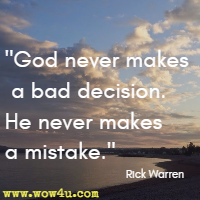 Think about this: God never makes a bad decision. He never makes a mistake. He says if we trust him and listen to him, he will guide us. But we must ask in faith. If there are things in your life you want to change, you don't change them from the outside in. You change them from the inside out. You don't need anyone else's approval to be happy. You're as happy you choose to be. Hope isn't the same as optimism. It isn't the belief that something bad will turn out well. It's the absolute confidence that every part of your life ultimately makes sense regardless of how it turns out this side of eternity. You may not think you have a good memory, but you remember what's important to you. When you understand how deeply God loves you, it will simplify your life. It will illuminate, protect, and energize you. Let's just be honest about it. Gossip, in its essence, is a form of retaliation. You're trying to get back at the person who offended you by talking about them behind their back. God can even take the negative and turn it into a positive if we let him. Use irritation as an opportunity to become more like Christ. 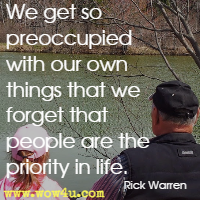 We get so preoccupied with our own things that we forget that people are the priority in life. When you get to the point in your life where you can say, "I praise the Lord no matter what happens," that is a confidence that you won't find anywhere in Hollywood, on Capitol Hill, or on Wall Street. That is a confidence built on a relationship with God! If you're going to entrust your life and your future to someone or something, you'd better choose someone who has your best interest at heart, knows everything, is perfect, and will never lie to you. That kind of limits your options - to God. We often don't want to get involved with other people's pain and brokenness because, quite frankly, it reminds us of our own. But mercy moves in spite of fear. Mercy touches the untouchable and loves the unlovable. Mercy takes action where others take off. Mercy isn't afraid to get its hands dirty. 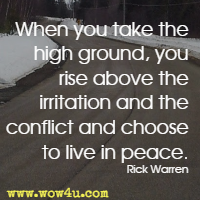 When you take the high ground, you rise above the irritation and the conflict and choose to live in peace.